This collection of short biographies of famous authors focuses on each author as a child, and what childhood experiences and situations led that person to become a writer. Including interesting biographies about authors such as Lucy Maud Montgomery, Laura Ingalls Wilder, J.R.R. Tolkien, Jules Verne, Mark Twain, Roald Dahl, J.K. Rowling, Sherman Alexie, and Stan Lee; this book covers authors from a wide variety of backgrounds and time periods for an eclectic look at what inspires readers to become writers. I loved reading about how particular childhood experiences like being bullied, being bitten by a giant spider, or growing up on a farm, directly influenced an author’s published works. It’s wonderful to see how these everyday things from childhood had a profound connection to the later writing that became so famous. 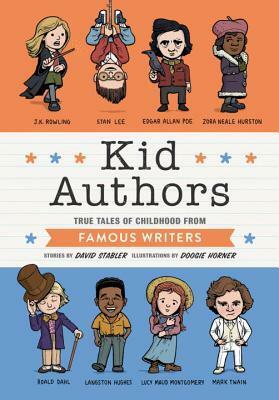 I was pleased to see many of my favorite authors in this book, and at the end of the book each page is filled with short paragraphs about even more authors, including just one little factoid about their childhood. So some authors get several pages of bio, and some authors only have one paragraph at the end. I liked that they added in extra authors at the back! The writing is engaging and fun to read. The stories are inspiring and thoughtful, and I enjoyed reading through each one. This book really made me think about my roots, what first attracted me to books, and how I first began to experiment with words and wrote my own little stories in school. Each author’s childhood story is accessible and memorable, and I was able to see myself in their shoes. I loved this book! This would be perfect to read in a classroom or as a family!